…if the inconceivable does happen and Donald Trump is elected President, what does the world have to look forward to? Probably four years of the abject subjugation of Mexicans, Muslims, immigrants, minorities and probably a lot more chaos, destruction and war all over the world. America would certainly be a no-go area for the vast majority of the world. Try as one may, it is hard to look beyond Donald Trump’s thorough distastefulness. Apart from being a most insecure public figure, he is a deeply sad and despicable character. His neurotic arrogance is evidence of a burly complex. His desperate ply for attention shows his throbbing need for the approval of others in order to endorse his self-esteem. The continuous declarations of his confidence expose that he is not self-persuaded. Now, gasping with a canine’s voracious fervour to be mollycoddled, Trump continues to resemble a Democratic joker to usher in another Democratic presidency in the United States of America. Unlike Walt Disney characters, which were described by the creator as “All cartoon characters and fables must be exaggeration, caricatures… It is the very nature of fantasy and fable,” there is nothing humorous or serious about this morbidly unpleasant exaggerated Donald the Duck. That is the perspective of an outsider looking in because no one in their right minds would imagine that American voters would be so reckless as to vote for such a despicable byped as president. But it appears that, no matter how outrageous Donald Trump’s behaviour is, he seems to resonate with the large slice of the conservative base he panders to. The support that this one man is receiving is very strange to the vast majority of the human race. It doesn’t take an avid political pundit or a hater to know that Donald Trump is a horrible candidate whose off-handed comments don’t appear to have clear planned solutions to give him credibility. He would most definitely make a very dangerous president. His prevailing polarising conversations about minorities and religion would most likely lead to further radicalisation. It’s hard not to conclude that this mentally imbalanced, monumentally nasty man is just having a laugh in this political misadventure. It really is hard to take serious the fact that this man is contesting to become the leader of the most powerful nation on earth. Listening to his absurd and self-serving rhetoric, it’s hard not to believe that he has got no real intention of being president. 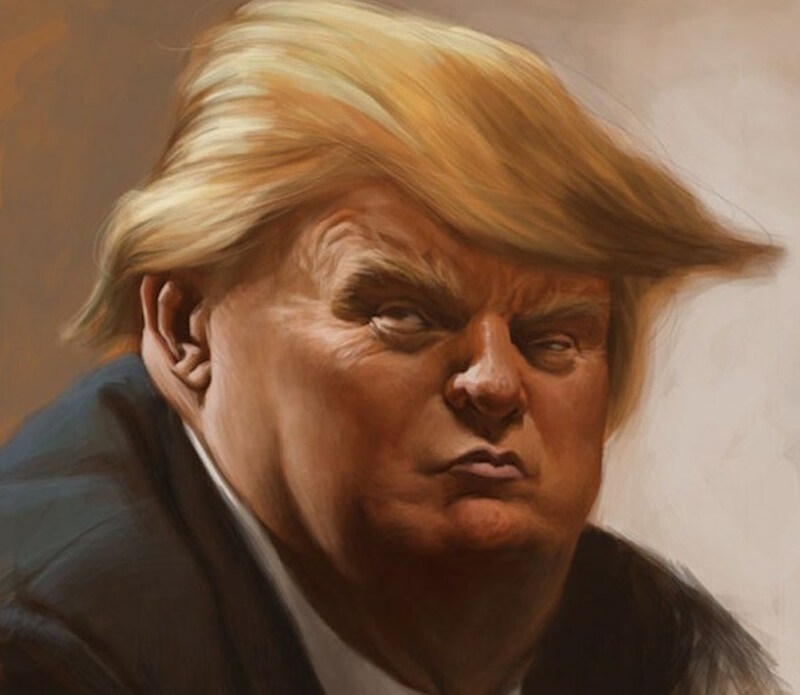 From his dreadful comb-over, to his extravagant pomposity, down to his narrative of discrimination and alienation, it is impossible for the reasonable mind to take Mr. Trump seriously. Who are these people that are actually taking this man seriously? He obviously has a dedicated following for him to be recording the kind of approval rating of his party that he does. But the answer to ‘why Trump’ is quite simple. He is leading in his party’s polls because Mr. Trump is very good at drawing attention to himself. In making political statements, Mr. Trump is rude and pointless. Anyone who doesn’t agree with him, he labels a ‘jerk,’ a ‘wierdo,’ as ‘dumb’ and as a ‘loser.’ He responds to criticism as if he is in a market or bar brawl or a primary schoolyard. The creator of the original Donald Duck described his kind of character best when he spoke of exaggerated caricatures because that is exactly what Donald Trump is, the exaggerated caricature of a nincompoop! How can such a man be expected to perform as the president of the United States? Being the leader of the ‘so called’ free world takes a personality that is more than a wealthy real estate mogul and reality show star. This, essentially, is what Donald Trump is. A bully that is as undiplomatic and vile as Trump cannot be US President! Despite the fact that Donald Trump is a force in the Republican presidential race with polls showing him taking the lead out of all the potential candidates. Apart from the fact that his horrible declarations command the attention of his tea party audience, it would be a monumental mistake for the whole world if Donald Trump ended up as President. But then again, if it is so absurd for him to emerge as President, why is he leading in the polls? Who are these people that are actually taking this man seriously? He obviously has a dedicated following for him to be recording the kind of approval rating of his party that he does. But the answer to ‘why Trump’ is quite simple. He is leading in his party’s polls because Mr. Trump is very good at drawing attention to himself. The fact that I am dedicating my time and attention to actually write an article about him, so many thousands of miles away from the land where he is contesting, is attributable to his genius at drawing the spotlight to himself. He flourishes on propaganda and has ignited the power of social media like no other. Honestly, one can imagine that the world would be a much more terrifying place if Trump was to be elected as US President. The numerous wars and most of the extremist uprising that we see in the world today stemmed from some of the controversial decisions that were made by a mistake of the American electorate when they voted a clueless President Bush into office. But yet and still, it is hard not to be convinced that the Democrats and media are more than happy to focus a spotlight on Mr. Trump’s tirades and torrent of offensive statements because they want him to emerge as the Republican presidential candidate. Because, having Donald Trump as the Republican candidate, going into the election, is the easiest way of ensuring that the Democratic party wins the Presidential election. Honestly, one can imagine that the world would be a much more terrifying place if Trump was to be elected as US President. The numerous wars and most of the extremist uprising that we see in the world today stemmed from some of the controversial decisions that were made by a mistake of the American electorate when they voted a clueless President Bush into office. The great foreboding of imagining that the world would be thrust into a similar or worse gauntlet, with the election of Trump, is just so overwhelming. One only wishes that the American Tea-party right wing were able to share this view. Though that is a tall order! You see, most right wing Americans have never travelled outside their country or even their state. They possess extraordinary, ignorant ideas about the world outside the United States. They believe that to be safe, they have to sleep with a rifle under their pillows. They believe that the best way to win a war is to fabricate a reason and take it to an imaginary enemy that targets America because America chooses freedom. If the rest of the world thinks that Donald Trump, like George Bush, is an ‘uninformed yob’ with the inability to construct a rational sentence or chart a reasonable discourse unless he is reading a script or spitting bars of warmongering, then we have the exact picture of the average Tea party loving, far right American. Forget about what we see in the Hollywood films and how tall their buildings are, those who think that Donald Trump is a breath of fresh air, a man whom ‘says it as it is,’ are truly the most backward of people. That would explain why they would celebrate the political emergence of a man whose unpredictable and conspiratorial temperament are so outlandish, it’s hard to take him seriously. If a large section of American society is willing to elect Donald Trump as president, then the whole world will have to appreciate the fact that America’s interest is not the same as everyone else’s, if they don’t already. Even with his non political views, this is a man who defies the medical experts and declares that vaccinations cause autism. This is a man that relishes in making malevolent, bigoted, racist, chauvinistic statements about women and minorities. He’s absolutely sure, for example, that Mexicans crossing the American borders are drug dealers and rapists. He uses his Scottish golf course to threaten the United Kingdom because members of the British Parliament dared to foster debate about him. This is not a rational man in any sense of the word. I once read somewhere that in the 1990s, a section of the American people got used to believing that war could be won by remote control in mobile phone games in which whole enemy battalions could be wiped out with the push of a button. Perhaps, that’s why some seem so willing to elect a leader who offends at will and makes the declaration of war, discrimination and hatred look as easy as D’bang’s “Oliver Twist” lyrics; so that he could smile and push the red button for them when the time comes. If a large section of American society is willing to elect Donald Trump as president, then the whole world will have to appreciate the fact that America’s interest is not the same as everyone else’s, if they don’t already. In such a horrifying case, it would be clear that a large section of the American society are only pre occupied with their interest and must achieve it regardless of what it takes. The whole world can go to blazes for all they care. So, if the inconceivable does happen and Donald Trump is elected President, what does the world have to look forward to? Probably four years of the abject subjugation of Mexicans, Muslims, immigrants, minorities and probably a lot more chaos, destruction and war all over the world. America would certainly be a no-go area for the vast majority of the world. It honestly would be shocking if the world got through the next four years without some military intervention against some country under a Trump presidency. Let’s then hope that the coverage and support Mr. Trump is getting is an ingenious way for the Democrats to inject themselves into the Republican camp in order to win the Presidential election. A way where they give the worst Republican candidate subliminal support and media exposure to ensure that he clinches the Republican ticket so that the Democratic presidential candidate has an advantage at the elections. Only God knows what will happen in the next American presidential election, whether Donald Trump will emerge as the Republican presidential candidate and whether the support he is receiving at his base will translate into victory at the general elections. But it is highly doubtful that even the most stupid Americans would be stupid enough to vote for Donald Trump to become President. If the Republicans gather to defend this malevolent character on the American political scene on the ridiculous notion that he is invigorating, anti-establishment and infuriates liberals, they will do significant damage to their cause and to the Republican Party. They will do damage and have a lot to loose from a successful Trump candidacy because that would be the easiest way for the Democrats to win the general election. A Trump win would be a choice for a self-fulfilling prophesy of Armageddon that will be accomplished through arrogance, stunted moral development, suppression of the opposition and the illusion of an offensive, mysterious enemy in the face of sheer ignorance led by Donald the Duck.